In Natural Remedies for Dogs and Cats, noted pet expert CJ Puotinen focuses on the power of alternative therapies to enrich the lives of dogs and cats. Puotinen shows how a well-balanced diet of the right herbs can prevent and treat a wide variety of health problems, restoring and rejuvenating the strength and vitality of our beloved household pets. Featuring advice from some of the world's leading holistic veterinarians and herbalists, this indispensable book includes an extensive list of resources, feeding programs with sample menus, and an herbal "pharmacy" of nearly fifty recipes for sprays, salves, tinctures, oils, and powders. Compassionate and practical, Natural Remedies for Dogs and Cats proves that the more you learn about common illnesses and how to prevent them, the happier, healthier and longer your animal's life can be. 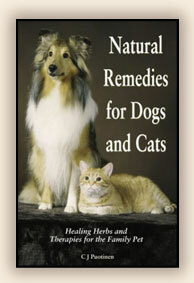 CJ Puotinen is the author of many books on natural health, including The Encyclopedia of Natural Pet Care. We highly recommend anything written by CJ Puotinen! It will contain clear, concise and reliable information, gathered, presented and combined with her vast background in holistic animal care.